The nonprofit BioEnterprise, with offices in Cleveland and Akron, was founded in 2002. Organizers wanted to speed the growth of medical businesses and bioscience technology by emphasizing the strengths of Northeast Ohio as a whole to venture capitalists. The same argument can be made for expanding the focus to include Pittsburgh, a major market closer to Akron than Ohio's own state capital, BioEnterprise Chief Executive Officer Baiju Shah said. ``The premise is if you combine the health care assets and activities in both regions, you get to a new level of national significance'' that could rival bioscience hotbeds like Research Triangle Park in North Carolina and the Twin Cities area of Minnesota, he said. BioEnterprise and its counterpart in Pittsburgh will continue to operate as separate organizations, making their regular rounds to both coasts to knock on the doors of investors. But now, both will plug health care companies from Northeast Ohio and Southwest Pennsylvania. Most people outside of this area don't realize the two areas are less than two hours apart, Shah said. But we belong to a single economy, he told 500 gathered for a BioEnterprise-sponsored conference on the Cleveland Clinic campus Tuesday, where he announced the new strategy. He made his point by showing a night shot of the United States from space, where the lights of Cleveland, Akron, Canton, Youngstown and Pittsburgh blend together. That visual of urban blending is a powerful metaphor and could serve as a unifying concept for a regional identity. Not surprising to this blog, Pop City notes that the Cleveburgh innovation corridor concept was part of the Great Lakes Region economic development plan. Underlying these initiatives is an attempt to forge a coherent landscape that could attract investment and jumpstart the Rust Belt economy. Though a mid-market city, Pittsburgh is frequently recognized as a hot-bed of green building activity, a leader among U.S. cities, ranking alongside San Francisco, Seattle and Portland. (Yes, Pittsburgh!) And, from an economic development perspective, this activity is generating a cluster of product and services businesses specializing in green buildings, with revenue opportunities far beyond the Pittsburgh region. Is Cleveland's proximity really that important in terms of collaboration? Might a deeper relationship with biotech in Boston prove to be more beneficial to Pittsburgh? I would think first about global connectivity before visiting the regional relationships. The Internet's early architects built the system on the principle of trust. Researchers largely knew one another, so they kept the shared network open and flexible -- qualities that proved key to its rapid growth. But spammers and hackers arrived as the network expanded and could roam freely because the Internet doesn't have built-in mechanisms for knowing with certainty who sent what. The network's designers also assumed that computers are in fixed locations and always connected. That's no longer the case with the proliferation of laptops, personal digital assistants and other mobile devices, all hopping from one wireless access point to another, losing their signals here and there. One of the great advantages of the current infrastructure is openness. Information flows are almost frictionless and the potential for collaboration is tremendous. That may benefit some kinds of information and knowledge exchanges, but not all. That same openness may discourage important inputs and kill potentially beneficial interactions. I liken the tension between the old and new information infrastructures to that of open and closed virtual communities. Open communities are experiments in anarchy. This is a great approach if your goal is as many contributors as possible. However, the quality of information exchange is poor and knowledge production is sorely lacking. Closing the community to a smaller group of people benefits collaboration, but limits the breadth of ideas and experiences. Greater accountability and trust are needed. Ideally, you could have an open community with high quality interactions. Clean slate projects could produce such a society, but would the number of users go down? I think many of the problems could be solved via social innovation, but I recognize the need for a secure network among members of a closed community. That's fine, as long as we don't lose the "old" internet. When I imagine Network Pittsburgh, I see a relatively open community with creative approaches to problems of trust and accountability. However, given the research going on at CMU, perhaps Network Pittsburgh would be a great pilot for a clean slate project. About 200 million migrants from different countries are scattered across the globe, supporting a population back home that is as big if not bigger. Were these half-billion or so people to constitute a state — migration nation — it would rank as the world’s third-largest. While some migrants go abroad with Ph.D.’s, most travel as Emmet did, with modest skills but fearsome motivation. The risks migrants face are widely known, including the risk of death, but the amounts they secure for their families have just recently come into view. Migrants worldwide sent home an estimated $300 billion last year — nearly three times the world’s foreign-aid budgets combined. These sums — “remittances” — bring Morocco more money than tourism does. They bring Sri Lanka more money than tea does. I doubt that the Burgh Diaspora is wiring (or will wire) millions of dollars back to Pittsburgh, but the fact that leaving one's home is good for personal and family prosperity is lost on those trying to solve the region's demographic "problem." Harold Miller writes in his most recent blog post, "Places like Silicon Valley, San Diego, and Boston had higher rates of domestic outmigration than Pittsburgh did (the outmigration rate in Silicon Valley was 6 times as high as in Pittsburgh)." Leaving your home is a risky venture, but potentially one with a huge payoff. The people who leave any region are often the most successful. Why would Pittsburgh stand in the way of such ambition? If the city and region purport to provide their citizens with a boost, they should be facilitating migration instead of impeding it. There's no such thing as an outmigration crisis. Pittsburgh is suffering from a lack of policy imagination and an unhealthy attachment to its natives. And when Mayor Luke played up the regional anxiety, he did so because he doesn't have a plan to improve Pittsburgh. He's merely pandering to his political base, telling his constituency what they want to hear. Like the fracas in Hazleton, hot button migration issues are the province of politicians who feel powerless to solve real problems. The Propel Pittsburgh Commission is a fresh dish of red herring. If Pittsburgh is to have a migration policy, it should be one that works with the flows, not against them. However, if there are young people who would prefer to stay, we should do what we can to help them. But that's a matter of job creation, not more nightlife hotspots. Mr. Landry thought that the Imagine Pittsburgh campaign would be more effective if, rather than focus on promoting Pittsburgh’s image, it spent its resources doing things for the rest of the world. He speculated that if Pittsburgh did interesting things that benefited the rest of the world, it would attract people who were interested in the things going on in Pittsburgh. I don't know if this Pittsburgh Homes Daily report on the Landry lecture is indicative of a building consensus, but I see Landry's recommendation as another endorsement for Pittsburgh leadership in the realm of global cities. Pittsburgh could best serve itself by serving others. I think an urban diaspora project is one of the many "interesting things" Pittsburgh could do that would attract people. Greatness is what wins international attention--greatness in vision, leadership, innovation. Pittsburgh is a city that, thanks to its congenial attitude and ecologically rich setting, is particularly well-suited to becoming a global model of the "Humane Metropolis" discussed in the previous post. Most of the Pittsburghers I've met have had a real sense of pride in place; though they may not live there, they have strong feelings about their hometown. Thus, their own pride is, in part, tied to the fortunes of the city. Re-shaping Pittsburgh as the new model of greatness for healthy urban regions in the coming century could serve as an excellent means for inspiring members of the diaspora to contribute to the prosperity of their former home. I've struggled with identifying a cause that might rally the Burgh Diaspora. Brendan, the person behind the Where blog, describes an effort worthy of Pittsburgh and its expatriates. I don't know if I could successfully pin down Pittsburgh pride, but I think Brendan is at least in the ballpark. As an outsider (and like Brendan, a connoisseur of place), I do sense a greatness about Pittsburgh. Perhaps that greatness has allowed the city to remain stoic in the face of adversity for too long. Eventually, that greatness will be channeled in a more productive direction. One piece of feedback I would offer to the Manifesto is that to talk about all the dependencies that Pittsburgh has on other cities, regions or countries has a negative connotation, almost of abandonment to the will of others. I believe it is much more productive to use the balancing force: influence. Influence that is exercised through the thousands of connected citizens that have a position of power in those regions. In a globalized world, it is true that every city depends on others, just as much as each city has influence on others. The main difference is that we can do a lot more with the latter. I think Juan makes a good point. Connectivity is a two-way street. Perhaps "inter-dependency" would be a better term, but even that doesn't fully appreciate Juan's concept of "influence." To push this dialog a bit further, why should we care about connectivity and a given city's global network? Juan sees world city connectivity as a force for positive change, with connectivity comes responsibility. Our approach, articulated in the Manifesto, is admittedly Pittsburgh-centric. Mike, Jim and I (among others) are trying to give Pittsburgh an economic lift and spur innovation. We want Pittsburgh to become the great world city we know it can be. But what about Pittsburgh's growing relationship with Bangalore and other cities in India? What about all the other cities around the world struggling with the same economic transformation? If you look at Pittsburgh's urban network, I'd like to think what is good for those cities is good for Pittsburgh (and vice versa). At this blog, the interest in the Pittsburgh Diaspora Project is decidedly non-Pittsburgh in orientation. I'm busy learning from other development amateurs (and experts). And for what it is worth, I'm attempting to share my discoveries with whomever is interested. I think anyone or anyplace could benefit from embracing labor mobility. But fully realizing those benefits is contingent upon greater connectivity. We seem to have the same ingredients of diaspora, global connections, virtual communities, art and culture. And we can clearly learn from their goal of capturing the and benefiting from the "intellectual, economic, and cultural capital" of their diaspora. In fact, read the Seven Principles of their Manifesto below and, as you read it, replace "Pittsburgh" with Metro Manila, "Pennsylvania" with the Philippines. With the exception of references to the Steelers -the rest of the ideas can very well apply to our city, our country and our diaspora. Pittsburgh could lead the way for urban innovation. Few cities can claim such a distinct and highly visible diaspora. In fact, I would argue that Pittsburgh is unique in that regard. Take "Pittsburgh Nation" and put another city in Pittsburgh's place. Sounds funny, doesn't it? In January of this year he made headlines by calling for a doubling of budgets for all Scottish universities, arguing that a massive investment in education was needed for Scotland to reap the dividends of the knowledge economy and, perhaps, bring about the much-vaunted Second Enlightenment. Advice to [Culture and Sport Glasgow head Bridget McConnell] will only come when it is asked for, however, said the cultural ambassador. "Let me quote Lord Chesterfield," Gregorian said. "Having expertise, knowledge or experience is like having a pocket watch. Wait until someone asks what time it is before you tell them - don't go round town saying, Do you want to know what time it is?' "So my role is that: to give advice when asked, and when appropriate," he added. While I think that the Indian Diaspora is the exemplar for the Burgh Diaspora, I think Scotland is a worthy model for the Pittsburgh region. Both Pittsburgh and Scotland can point to an economic and cultural golden era, a difficult economic transition, and a large, successful Diaspora. As Gregorian recommends, the first move is Pittsburgh's. The Burgh Diaspora is waiting. "There is an enormous potential" in diaspora giving, says Kathleen D. McCarthy, a history professor at the Graduate School and University Center of the City University of New York who studies philanthropy. "People are just beginning to figure out how to tap it..."
...In an era of cheap international travel and high-tech communications, "our very notions of community are being redefined," Ms. McCarthy observes. "With constant migrations of people and with the Internet as a way of keeping in touch as a community, there's a possibility for rethinking the scope and nature of philanthropy." Since its formation in 2003, Steeltown has recruited 40 former Pittsburghers now successfully working in New York and Los Angeles to serve as Steeltown advisors. Steeltown has participated in dozens of conversations with advisors regarding film and television projects that they could bring to the Pittsburgh region and has, in collaboration with the student organization Pitt-in-Hollywood, presented over 30 speakers from the entertainment industry. One of the results of these efforts is an identifiable Pittsburgh community in Los Angeles, poised to help aspiring talent currently "incubating" back home. This isn't necessarily a story about remittances from Pittsburghers working "abroad", but all kinds of capital are made available to people in Pittsburgh. I'm curious to see how successful these initiatives are keeping creativity in Pittsburgh. I'd bet such organizations help Pittsburgh students successfully migrate to New York or Los Angeles. If that's true, that's good news. Pittsburgh will still be known as a great place to start out in the film industry. On the heels of news that only hurricane-struck New Orleans lost more people this decade than the Pittsburgh region did, Mayor Luke Ravenstahl yesterday announced something new: The Propel Pittsburgh Commission. Somebody, please explain to me how Mayor Luke's bold plan is somehow different than the lame political gambit that Chris Briem so rightfully mocks. Edit: I notice that Chris Briem is already on top of Mayor Luke's bold, new plan. Regardless, I needed to vent. My plan is to try to incorporate into this blog the seven principles Mike Madison listed in the Manifesto for a New Pittsburgh. First, I thought I could come up with new tags, corresponding with each principle. But revisiting the Manifesto, I think I already have six tags that fit. 1. Connect and reconnect with the virtual Pittsburgh. The main theme of the Manifesto is connectivity. Informing the Burgh Diaspora blog is the phenomenon of labor mobility, but connectivity is the subject of the majority of my posts. Fittingly, I think, the first principle stresses the importance of connectivity for Pittsburgh. 2. Bring new resources to the region. The second principle is about an expanded concept of regional resources. Perhaps I'm trying too hard to make my current list of tags fit, but the posts about innovation seem to mesh well with this principle. 3. Energize Pittsburgh’s culture and community. The term "diaspora" does a good job of capturing the idea of a global community. Pittsburgh exists in more places than just Southwestern Pennsylvania. If the second principle expands the concept of regional resources, the third principle expands the concept of community. 4. Listen for new voices. I suppose "new voices" could also fall under innovation, but I think the tag "frontier geographies" is a better match with the fourth principle. The margin is another word for frontier. I think of the Diaspora as Pittsburgh's modern day pioneers. 5. Change the face of Pittsburgh. The fifth principle dovetails well with my theme of "migration." The demography of Pittsburgh is a reflection of its global reach. 6. Build on the best of Pittsburgh’s past. I don't have a tag or theme that captures the sixth principle. I've done little to celebrate Pittsburgh's past, but I recognize how important that history is to the Burgh Diaspora. Nostalgia for Pittsburgh is the glue that holds the Diaspora together. This is "civic pride" and the tag for this post. 7. Recognize the geopolitics of the neighborhood. The seventh principle outlines the geographic transformations we are all experiencing. Globalization is driving the new geopolitics, which I explore through the theme of labor mobility. If Pittsburgh wants to help its children deal with the challenges of globalization, it should encourage mobility. Migration is a great adaptive strategy to macro-economic shocks. The successes of the Burgh Diaspora are a testament to this approach to dealing with hard times. So, I went to NY to network and catch the solo of an artist from Pittsburgh that has had some stuff in my gallery. From my past experience, I usually find that with almost no research, I run into 3-5 shows of artists with strong Pittsburgh ties per trip - not counting Andy Warhol. A last minute email from another artist clued me in on my own role in a group show which was a great bonus. John Morris' networking in New York City is exactly the kind of effort I had in mind when I wrote about the New Pittsburgh Manifesto, "The goal now, as articulated in the Manifesto, is to deepen the relationship between local Pittsburgh and global Pittsburgh." I would liken Morris' role to that of an ambassador, helping Pittburgh artists thrive in the big city while advertising the advantages of taking up residence in Pittsburgh. I'd like to see the Pittsburgh-NYC artist connection made more visible. Artists trained in Pittsburgh might find relocation to the Big Apple a bit easier and less intimidating, while more established artists might consider opening their first gallery in Pittsburgh, where rents are cheaper. For a glimpse of the potential, read this post about Bohemian Nomads and the gentrification of Paducah, KY.
We call on the Pittsburgh diaspora to embrace these principles and to partner with the residents of Pittsburgh today in moving the region forward. To date, I've labored to demonstrate the latent value resting within the Burgh Diaspora, my target audience the residents of the Pittsburgh region. I hoped to connect with like-minded people. I had no idea how easy making those connections would be. I am confident that Pittsburgh is ready and willing to reach out to its Diaspora. The goal now, as articulated in the Manifesto, is to deepen the relationship between local Pittsburgh and global Pittsburgh. While I hope other parties living in Southwestern Pennsylvania (and Eastern Ohio and Northern West Virginia) continue to join the cause, we await to hear from the expatriates living all over the country and around the world. One reason for the growth, the company says, is the Fargo branch's ability to find talented employees who work for less money than those in Seattle and other cities - despite some reservations about moving to North Dakota. They come mostly from the Midwest. I don't want to overstate one lonely example, but Fargo is certainly bucking the trend of rich cities getting richer thanks to talent pooling in select locations that facilitate career advancement. And not to solicit hate e-mail, but living in North Dakota is not easy. The well-educated who are familiar with the region's downside and upside, are the ones most likely to respond to Microsoft's offer of employment. Cheaper living can attract talent as long as that demographic already appreciates the sunny side of the landscape. These externalities of labor mobility can provide economically struggling areas with a competitive advantage. All of the top ten most expensive cities in the world, except Reykjavik, make the top fifty. So even if money doesn't buy you happiness, at least it gets you quality of life. According to the survey, the best places in the United States are (in order of ranking): Honolulu, San Francisco, Boston, DC, Chicago, Portland, NYC, and Seattle. Of interest, Mercer also provides a ranking of "health and sanitation." Pittsburgh is tied for tenth best in the WORLD. The Heinz Endowments has invested $600,000 into a three-year effort to tap into the skills, connections and perhaps the wallets of the Pittsburgh "diaspora" -- people living and working all over the world with ties to Carnegie Mellon University and a yen for Pittsburgh. The goal, said Christina Gabriel, the endowment's director of innovation economy programs, is to ignite growth in the local startup sector by linking the startups to the legions of well-connected talent in other locales. Huzzah! I'm reminded that the Post-Gazette once quoted Dr. Gabriel as saying, "We should look at the Steeler Nation. It says there is a diaspora out there, and if there were jobs, many of those people would come streaming back." I don't know if they would come streaming back, but I'm delighted to see her follow up on that particular vision. I look forward to reading Mr. Bonk's plan, which is supposed to be done later this month. In the end, I think Madison and Hermann get it backwards. Entertainment for hockey fans is just about the ONLY reason to support this stadium deal. Because using a stadium to provide "economic impact" has been tried in a lot of places. And failed. AntiRust makes a strong case against the Madison-Hermann proposal, citing a Brookings report on the economic impact of stadium deals, that the promise of more tourist dollars (among other things) creates false expectations. The public return on invest is nil to negative. I think Madison and Hermann are offering a somewhat novel approach to squeezing some regional benefit from keeping the Penguins in town. There might be a bit of tourist boon to the area if you can figure out how to attract out-of-town hockey fans to watch the Penguins in Pittsburgh. 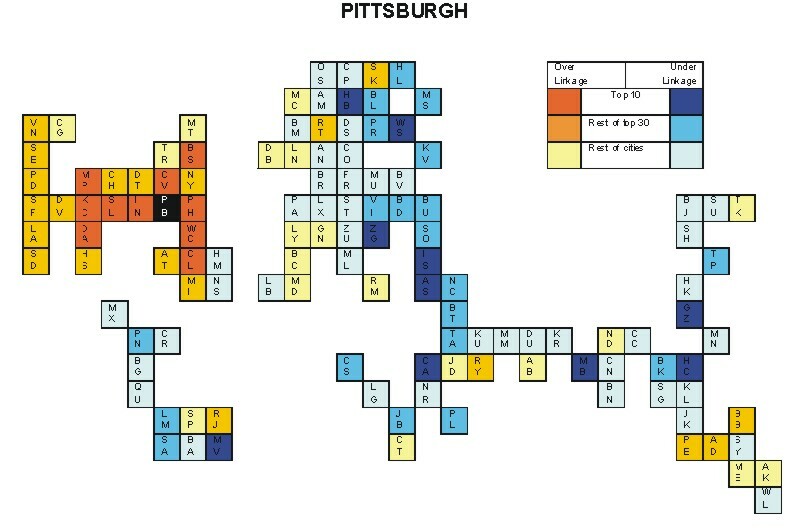 I know from experience, that there are various barriers that prevent fans from afar making the pilgrimage to Pittsburgh to see their favorite team live. This kind of journey could be better facilitated, with the right kind of marketing research and outreach. The process starts with a clever campaign for the road games, where the Burgh Diaspora is waiting to see Crosby and the new Pens. There is a long tradition in conventional urban geography of measuring the hinterlands of towns and cities. The concept of hinterworld has been created to describe the worldwide pattern of connections between a given world city and other world cities under conditions of contemporary globalization. I'd like to make a similar map of Pittsburgh's Diaspora. The Rust Belt is Dead. Long Live the Rust Belt. As the workers depart in greater numbers than either their union or their employers anticipated, the exodus becomes more than a long ledger of altered lives. It is an accounting, of course, but an accounting of the most personal and poignant sort. Communities are fragmenting, families are relocating, and years of individual choices tethered to the notion of a certain kind of job in a certain kind of place are giving way to uncertainty, regret and loss of control. This is a tale of globalization and the resulting great migration. Actually, this is the tale of the people globalization left behind. And the struggle is one of refusing to move in order to improve. My take is that globalization will reward the most mobile. Globalization will also reward the places most open to mobility. I'd spend more resources on helping people relocate than helping people retrain. Instead, those who leave are ostracized because they "gave up." Migration demands courage, vision and will. The exodus reflects the region's grit and ambition. However, current policy stifles these positive attributes.